There’s nothing more exciting than a wedding invitation. You can already see the bride in white and her groom in your mind, kissing in front of their tearful friends and relatives. You already imagine the music at the party after the ceremony, and you are almost certain that you’ll have to stay away from the delicious cocktails. You might even wonder if you want to restart your gym membership to look good in your dress – after all, a wedding gives you the perfect occasion to flaunt your fit figure in a dramatic open-back dress. Except that when the invitation is short-notice, you may feel more stressed out than excited about the big day. Will you have enough time to prepare your arrival, find a room and get a present that will show your appreciation to the married couple? Relax. You can get ready for a last-minute wedding in no time. Just make yourself a soothing cup of tea and turn your laptop on: It’s time to go digital on your wedding preps! First of all, sit down and check where the venue is. 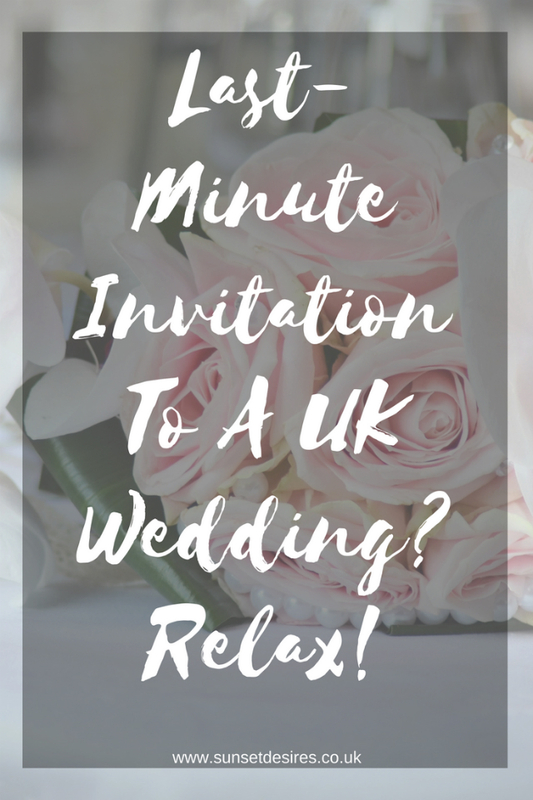 You’ll be surprised to find out that some of the most popular wedding venues in the country are also difficult to reach with public transport, such as the Lake District and its tranquil landscapes or the quirkiness of a Scottish manor house. But there’s a reason for the choice: Beautiful and quiet places are isolated, giving the wedding party some peace and fantastic backdrop to the pictures. But thankfully, popular venues have a website that takes you through its secrets, from the owls in Muncaster Castle to the lakeside setting of Waterhead. You can also find some travel instructions and accommodation recommendations too. Besides, you can directly get in touch with the venue and ask them for advice! What should you wear to a wedding? If the invitation doesn’t mention any theme — be glad you don’t have to go dressed up as Harry Potter, for a start – you can opt for a classic and elegant multi-layered dress, which is perfect if you haven’t had time to hit the gym! A brilliant alternative, if you’re worried about getting cold in a dress, is to wear a long satin jumpsuit. There are many original and attractive jumpsuits in high street fashion shops that will guarantee you’ll get compliments on your excellent taste. When you only have a couple of weeks to think of a present, it can be difficult to find something personal. Indeed, you can’t be creative when you’re panicking! But relax, there are plenty of brilliant ideas that will make your gift unique and very original. You can plan for a monthly wine delivery, via a subscription for a year or half a year — which is always a hit for new couples! You can think ahead and get them a hotel voucher for their one-year anniversary, which is a cute idea to show your appreciation of their relationship. In short, there’s no need to panic. Even with only a few days to plan, you can make sure to celebrate a last-minute wedding in style with the couple. Want to read more lifestyle-related posts?